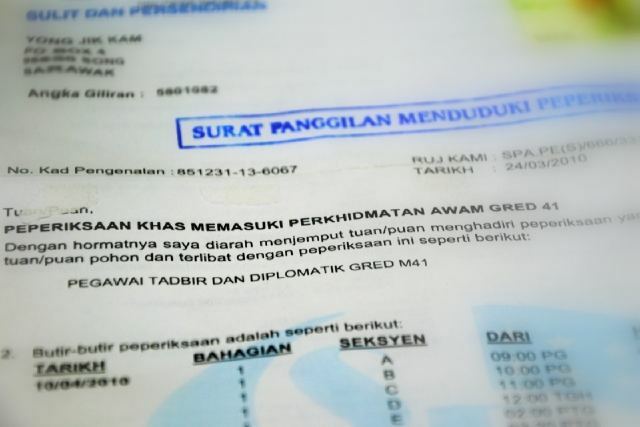 Last Saturday, I spent the whole day taking an entrance exam for the post of Pegawai Tadbir & Diplomatik (PTD) M41. The 1st paper was on General Knowledge & I found it quite easy. A majority of the questions were on government policies. There are some questions on specific knowledge. For example, ‘which are movies directed by Yasmin Ahmad’ & ‘who were the founders of Google’. The 2nd paper was a mathematics paper which was easier than my SPM exam. Most of it was situation questions that made use of multiplication, summing, percentage & algebra. I was allowed to use a calculator & I think I will get 99% on that paper. It was that easy. Paper 3 was a simple comprehension paper on both BI & BM. 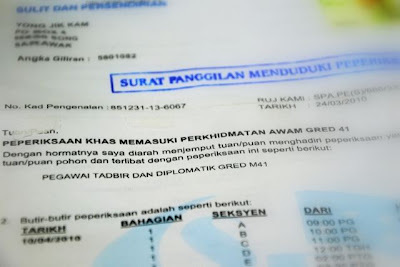 If you got A1 for both subjects in SPM, it shouldn’t be a problem for you. Very simple SPM level questions. They also asked about idioms, proverbs & correct use of words. Papers 4 & 5 were essay papers where you wrote on 1 of 3 questions. Mostly discussions of current events or how you can achieve a certain goal. The English language essay was the last paper so I couldn’t resist choosing a topic that pretty much summed up my application. I liked what I wrote so much that I’m going to share it with you at the bottom of this post. Finally, we were given a personality test & personal interest test. The personality test was really simple with some ridiculous questions like ‘have you ever lied before’ or ‘is it true that when there are no cars, you don’t have to stop at a red traffic light’. The interest test was a series of ‘yes’ or ‘no’ questions asking you about what you can do or what you want to do. I am confident in making it to the next stage of the screening process. Well, at least I’ll be a borderline case. All the best in yours if you’re applying too! Here’s my 700++ word essay. Our time is a time of strife & struggle. As our economy is suffering from a recession, the number of those being laid off & unemployed will only increase. Furthermore, every few months, thousands & thousands of new graduates enter the job market. Organisations are spoilt for choice & will only choose the cream of the crop. I firmly believe that I am one of those among the best. I think that I possess the qualities to become a valuable member of the organisation I intend to serve in. Before you write me off as a narcissistic pompous overconfident fellow, allow me to share with you how I can be a valuable member in the organisation. As competition intensifies & more people are laid off, managers & employers are looking for people who are able to go the extra mile & take on the work of two, three or maybe more people. I believe that I am a dedicated & hard-working person. I am currently a teacher in a rural school short of teachers & have proven myself capable of carrying on my shoulders the workload of two or three teachers. Besides teaching 24 periods every week, I am the school photographer, magazine editor, newspaper editor, debate team trainer & public speaking trainer. Furthermore, I am the head advisor for the Police Cadets & the English Language Society. Let me assure you that I work hard to meet deadlines & ensure quality work. Just ask anyone in SMK Katibas, Song. I believe this quality of mine is transferable to any organisation; particularly the one that I intend to serve in. This is one of the ways for me to be a valuable member in the organisation. Being hardworking is not enough. Sometimes a person has to manage several large scale projects that involve multiple persons & multiple sources. A person who is tardy & happy-go-lucky will not be able to cope. To be a valuable member of an organisation, one has to plan & be a good planner. I believe I have good foresight & intellect to be a good planner. This year, I was put in charge of 3 major posts in the school. I am the English language panel head, editor of the school magazine & head advisor of 2 clubs. I managed to plan the yearly activities according to the resources available. I was also able to pick out outstanding individuals to lead some of the activities from both students & teachers because I knew that with so many duties, I need to plan ahead & make sure that there are additional people to watch over key activities. I believe that this skill in planning & foresight is how I can be a valuable member in the organisation I intend to serve in. Every employer will be looking for people with leadership skills. No matter what post or position, people with leadership skills will be able to inspire co-workers & take the organisation to a whole new level. I believe that I have the leadership skills & charisma to compel co-workers to work with me & for me. My positive can-do attitude & never-say-never attitude has always inspired others. I am able to work in a team & carry my fair share of weight. This can be seen in the successful publications of the school magazine & school newspaper. This can also be seen in the success of the many activities I am in charge of. I am not conceited as to say that I did all that by myself. All of my achievements are a testament of other people working for me & with me. It goes to show that it is one of the ways I can be a valuable member in the organisation I intend to serve in. Finally, let me end by saying that I am not perfect. I will never be perfect. The day that I begin to think I am perfect will be the day of my downfall. Even though I am hardworking, dedicated & have good foresight, planning skills, leadership skills & charisma, I have flaws. However, this does not mean that I give in to my flaws. On the contrary, I am a firm believer of lifelong learning & I have not met a man who has drowned in his own sweat. I will get better & better as the years go by. At least, that is my ultimate hope & desire. Now tell me, how can such a person not become a valuable member in any organisation?